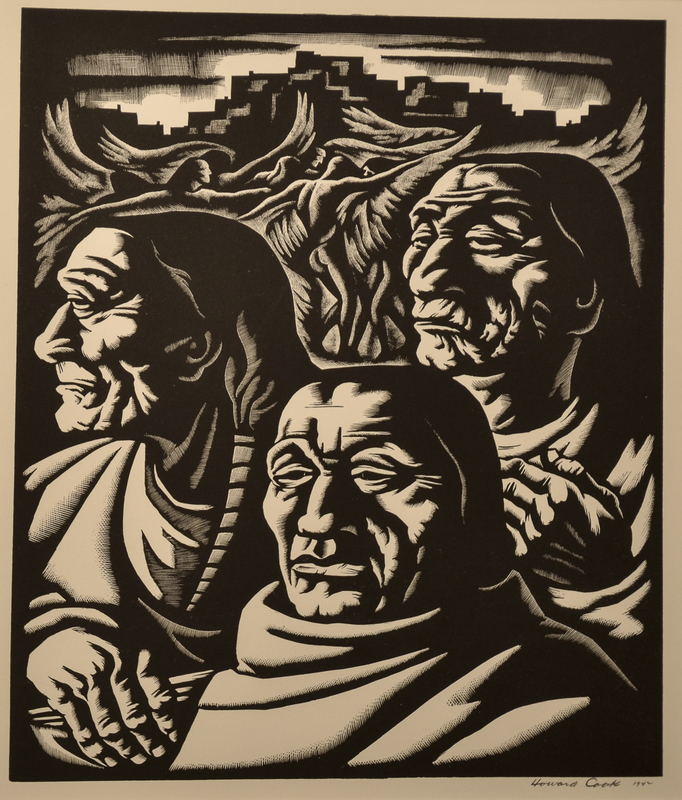 Considered one of America’s best-known print makers including a series of woodcuts of the Grand Canyon in 1927, Howard Cook was also a painter, illustrator and lecturer who served frequently as guest professor in numerous universities and art schools. In 1926, he took his first trip West and served as an illustrator for “Forum” magazine. He married Barbara Latham, modernist Southwest artist, and also developed a great fascination for the Santa Fe and Taos areas, where he became a resident. In 1937, he won the largest mural commission ever given to a Taos artist when the Treasury Department’s Section of Painting and Sculpture chose him to paint sixteen fresco murals in the lobby of the main post office in San Antonio, Texas. His frescoes portray a history of Texas from the days of the Spanish conquest to the 1930s. In 1967 was appointed the first artist-in- residence at the Roswell Museum in Roswell, New Mexico. In the 1930s, he twice earned Guggenheim Fellowships, spending one year and a half painting in Taxco, Mexico, and also time in the Deep South where he painted and did prints of genre scenes of black people. These works are now in the Georgia Museum of Art and the J. Frank Dobie Collection at the University of Texas. During World War II, he was an artist and war correspondent in the South Pacific, and his illustrations from this time were exhibited at the War department at the National Gallery of Art in Washington D.C. and later circulated as a traveling exhibition.